This allows your visitors to search the contents of your site. Powered by Google, Yahoo and other major search providers. Allows visitors to sign-up for membership on your site. Send e-mails to all your members at once. Allows 'member-only' access to site content. Automated and template-based data collection from site visitors. Automatic image resize and thumbnail creation. Create and easily manage news articles. Add a thumbnail photo to each article. Start and stop date for articles. Set-up and manage an extremely easy-to-use E-commerce store. Automatic thumbnail creation, drag & drop management, easy-to-use interface for your site visitors. Upload and manage banner ads on your site. List staff bios with pictures and contact information. List single or multiple locations. Includes small gallery, automatic thumbnail and image resizing on the server. Google Maps automatically generated to display your location. Upload and easily manage multiple documents. Create password protected categories of documents. Additional e-mail accounts can be added for $1.20/month per address. This allows you to have multiple e-mail addresses point to the same e-mail account. 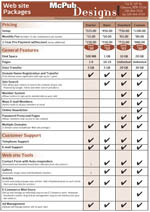 "Custom Web site Support Plans" – We'll do the work for you! We will set-up your new site based on your current set-up. Automatically submit your site to all the major search engines. © 2010-16 McPubDesigns.com, marketing solutions by McLeod Publishing, Inc.